When you get the screen with King Neptune on it, what the heck does he have in his mouth? What are those little orange things coming out of King Neptune’s mouth? I thought they were Cheez Doodles. I may be mistaken. The tentacles of the Jelly he is currently devouring. If you look to the right you’ll see an intact and frightened jelly. @JilltheTooth Thank you! Now I feel stupid! I’ve actually never seen that other little jelly. Shows how much I pay attention to detail! You come here thinking this is a nice place, that everyone is nice. Then you see King Neptune, devouring helpless jellies. No, no, he’s devouring EVIL Jellies! Banned Jellies, Jellies who refused to play nice and left in a huff! Now I’m going to have dreams of King Neptune coming out of my closet with a filleting knife. Beware! @chyna : Stop scaring the children! @JilltheTooth Who you callin children? And he’s smiling as he eats a jelly. @queenie ; Anyone under 50! @chyna : That’s cuz we’re all such tasty little morsels! Hi, Doggie Darlin! Glad to see you! don’t ask . . .
A fellow jelly. Beware, if you piss the mods off, they will have you eaten!!! This has posed problems before—cheez-doodles don’t quite get it. BTW non sequitur—those jellies Neptune is eating look like crinkly french fries. I didn’t realize they were jellies at first. 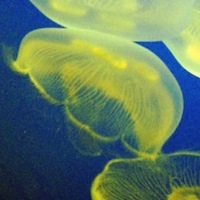 contains an interesting discussion of 3-legged jellies! A jelly made of cheese doodles.